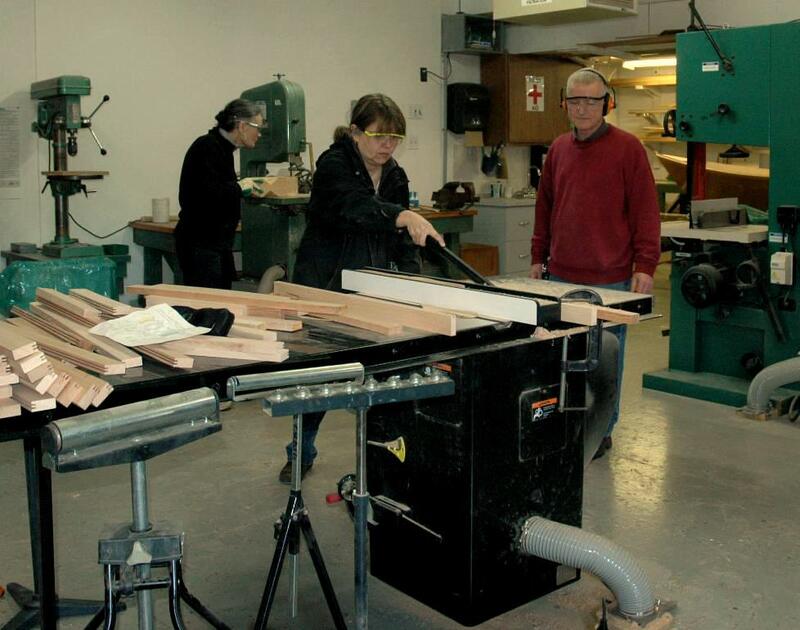 Carol Collins (left) uses the bandsaw to cut parts for a garden obelisk, while Joy Davis (centre) cuts dados in her kitchen door frames, watched by instructor David Skelhon. Six enthusiastic women attended the Maritime Centre’s Womens Woodworking Course this winter, with projects ranging from garden cold frames to kitchen cabinet doors. Some had no previous woodworking experience whilst others wanted to use the Centre’s machines to complete projects. With such wide ranging projects it was challenging for the instructor, but students appreciated the opportunity to watch the progress of other projects and see techniques such as laminating curves, milling lumber, and using tools such as biscuit jointer and the big resaw bandsaw. The course is running on Saturday mornings for 7 weeks, with the first 2 sessions dedicated to safe operation of the shop machines and the remaining sessions for project work. Students can book shop time after the course to finish their projects. Demand for the course was considerable and another is planned for later in the year.